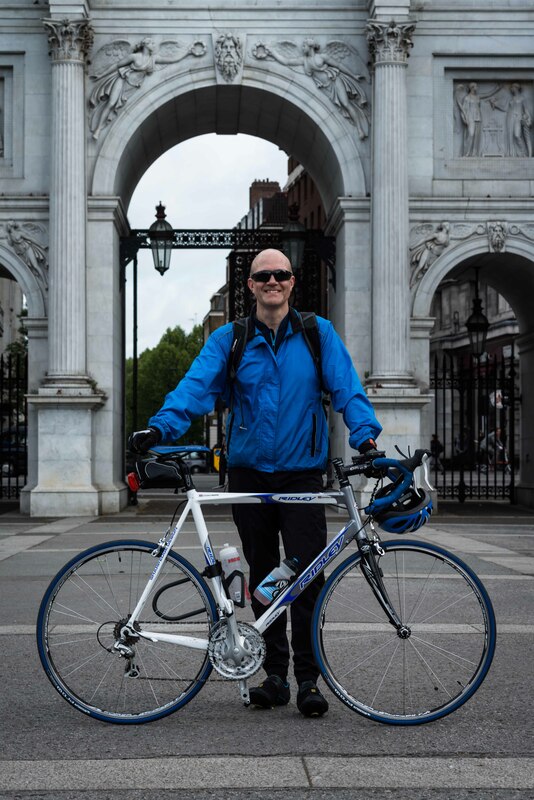 Charity trustee Jonathan Mason has just returned from completing a London to Paris bike ride in aid of Pharmacist Support. His three day adventure saw him cover over 100 miles a day, tackle some lung busting climbs and impassable tracks, battle the elements, seek shelter in bushes and almost lose a pedal! Here he shares his story. I started the day bright and early with a gentle warm up to the starting point at Marble Arch. After the obligatory photos, I pulled on my rucksack, tightened the straps and set off. Soon I was out of London and onto the roads of Kent, where the traffic lightened and I was looking forward to a quiet ride to Dover. I stopped off for lunch in the garden of a pub in Bearsted (near to the pharmacy I used to manage) and was making very good time to Folkestone until disaster struck! I was climbing a steep hill leading out of Folkestone when the pedals suddenly stopped and I heard a terrible grinding, crunching sound. I looked down and saw that the rear mechanism had sheared off and was jammed into the back wheel. I dropped off my bike and sat on the verge to gather my thoughts. I had visions of not getting to Dover, let alone all the way to Paris. I searched on my phone for bike shops in Folkestone and found one about 1.5km downhill from where I was. I limped my way down the hill to the shop where the mechanic carried out the repairs. Half an hour later, my bike was fixed and feeling refreshed I set off again. The 2.9km hill approaching Dover, with a 154m climb, was a real lung-buster at the end of a long day in the saddle! But as I always say, every uphill is followed by a downhill and once over the summit it was mostly downhill to Dover. As I sped down at over 70kmh, I finally saw the English Channel, which gave me the boost I needed. I negotiated my way through Dover Docks and boarded the ferry. Fuelled by a big breakfast of croissants, bread and cheese I was ready for the journey ahead. As I cycled from Calais, the wind picked up and I cycled into a headwind for most of the day. It rained steadily from the time I left Calais, until the final hour. The friendliness of the people who welcomed me at a small café where I stopped for a break to get away from the rain and to have a coffee was a real boost to my morale. They welcomed me in, asked me about my trip and refilled my drinking bottles. They even brought me a towel to dry off with! As I approached the village of Licques, I nearly ended up in a professional bike race across Northern France. The race marshals directed me through the village and along the race route. By the time I had followed the diversions in place for the race my distance to Amiens had significantly increased! Later in the afternoon, when I was about an hour from Amiens, the clouds finally dispersed and the sun came out. By the time I arrived in Amiens it was warm and sunny. I found my hotel, had a long, hot shower, then set off to explore Amiens and its cathedral, which is one of the largest in Northern Europe and a fine example of Gothic architecture. I ended my day in a local brasserie where I settled down to eat a fantastic steak burger, cooked to perfection, with a large portion of chips, washed down with a refreshing glass of beer. I awoke ready for the final day’s cycling – the weather in Amiens was looking good, still windy, but at least it was sunny. However, within 10 minutes things changed, it started raining and the wind picked up. I was facing strong headwinds, which occasionally changed to crosswinds that nearly blew me off my bike, along with rain and at one point hail. There were a couple of times when the weather was so bad, I had to stop. The lowest point came after I had ridden for several kilometres up a long, shallow incline, followed by a steep uphill. As I rounded the bend at the summit of the climb, I was hit full in the face with an incredibly strong headwind and driving rain. I could ride no further, the wind was too strong. I climbed off my bike and took shelter under a bush until the wind and rain eased off. The afternoon was a long, seemingly endless ride along straight, undulating roads, into headwinds and driving rain. I crossed the River Oise only to find that my map became useless. What I thought was a road turned out to be an impassable track, over a very steep hill, in the middle of a forest. I asked for directions and was sent off on a long detour but I was assured that there was no way I would be able to ride my road bike up and over the track. In the event, the route they sent me on proved to be the best section of road I had ridden on all day with smooth tarmac and a welcome tailwind. After I reached the town of Viarmes I was on the last leg of my journey to Paris. As I got closer to the outskirts, warm sun replaced the wind and rain from earlier. Cycling through Domont, I picked up my first puncture. Fortunately, this happened on a cycle path rather than the main road and I was able to replace the inner tube and pump up the tyre before setting off up the hill to Montmorency. As I started the descent I rounded a corner to my first glimpse of the Eiffel Tower – I had almost made it! As I raced downhill I crossed the Seine for the first time and felt uplifted and ready for the final push towards the Arc de Triomphe. I rounded the corner onto the Champs Elysees and headed uphill along the cobbles. Finally, just after 8PM, I reached the Arc de Triomphe. Bathed in the setting sun it was a sight for sore eyes! I climbed off my bike, sat down and reflected for a minute before capturing my moment of triumph with a few photos and texts to friends and family. After a short ride over the other side of the Seine I reached my hotel and quickly sank into the big hot bath! The sense of achievement when I finished was so invigorating and knowing I was riding for Pharmacist Support gave me the incentive I needed when I was feeling low. There were a couple of occasions where I felt very down, I was cold, wet and lonely but knowing that I was riding to help others made me buck up and get on with it! Jonathan has so far raised over £700 for Pharmacist Support. If you have not done so already and would still like to donate, it’s not too late. Visit Jonathans fundraising page today and leave him a message! If you would like to take on a challenge for Pharmacist Support, get in touch –we’d love to hear from you!